PE0203. Arlette (Guy Le Feuvre & Ivor Novello),w.Winifred Barnes, Joseph Coyne, Stanley Lupino, Leonard Hornsey, Adrah Fair, Johnny Fields, Leonard McKay, etc. (England) Palaeophonics 104, recorded 1917, w.Elaborate ‘The Play’ 20pp. Brochure replete w.photos from the London production. 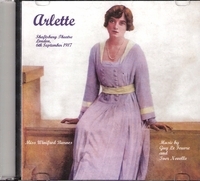 “George Grossmith & Edward Laurillard present ARLETTE: an operette in three acts / book by Claude Ronald and L. Bouvet; translated by Jose Levy; adapted for the English stage by Austen Hurgon and George Arthurs; music by Guy Le Feuvre and Ivor Novello; lyrics by Adrian Ross and Clifford Grey. In London Ivor Novello found a mentor in Sir Edward Marsh, a well-known patron of the arts. Marsh encouraged him to compose and introduced him to people who could help his career. He adopted part of his mother's maiden name, ‘Novello’ as his professional surname, although he did not change it legally until 1927. In 1914, at the start of the First World War, Novello wrote ‘Keep the Home Fires Burning’, a song that expressed the feelings of innumerable families sundered by World War I. Novello composed the music for the song to a lyric by the American Lena Guilbert-Ford, and it became a huge popular success, bringing Novello money and fame at the age of 21. In other respects, the war had less impact on Novello than on many young men of his age. He avoided active service until June 1916, when he reported to a Royal Naval Air Service (RNAS) training depot as a probationary flight sub-lieutenant. After twice crashing an aeroplane, and with the influence of Marsh, he was moved to the Air Ministry office in central London performing clerical duties for the duration of the war. Novello continued to write songs while serving in the RNAS. He had his first stage success with THEODORE & CO in 1916, a production by George Grossmith, Jr. and Edward Laurillard with a score composed by Novello and the young Jerome Kern. In the same year, Novello contributed to André Charlot's revue SEE-SAW. In 1917 he wrote for another Grossmith and Laurillard production, the operette ARLETTE, for which he contributed additional numbers to an existing French score by Jane Vieu and Guy le Feuvre. In the same year, Marsh introduced him to the actor Bobbie Andrews, who became Novello's life partner. Andrews introduced Novello to the young Noël Coward. Coward, six years Novello's junior, was deeply envious of Novello's effortless glamour. He wrote, ‘I just felt suddenly conscious of the long way I had to go before I could break into the magic atmosphere in which he moved and breathed with such nonchalance’.